Good cable at a great price. Best signal for the price. Better than the big box store. This is very good quality cable. I purchased this cabe for multiple purposes; home networking and live audio. Mainly audio. This cable is great to the fact I can bend the cable and it keeps it shape to some extent or if I am aligning it with poles is great. Presonus StudioLive 328AI loud speakers & 32RM AI-Mixer- networked Motu AVB switch and TP-LINK TL-WR1043ND Ultimate Wireless N300 Router. I would recommend this product to anyone especially for the price and 1000 feet of cable. I'm making my cables now! No issues so far. Works great. 4.500Will purchase two more rolls of this cable again at least. Just ran half of the overall network runs that I plan on using this cable. I have ran cable numerous times in the past with what ever I am supplied by someone higher up and have been searching for a good rigid strong cable. Used all but 200 foot of the spool no broken pairs or issues pulling from the box what so ever. Longest runs two of them according to a Fluke LinkRunner LRAT-2000 are just over 100 foot no issues what so ever. Will be ordering more of this cable later in the year for when I go to install my future security cameras. -Bright vibrant colors can easily distinguish the stripped wires from one another and can tell the green/blue apart easily. -Solid copper! It's hard to find network cable that isn't CCA these days for some reason which is a BIG NO NO. -Very strong and rigid. -Went smoothly into all keystones patch panel and RJ45 ends. -States on the cable about how much is left in the pull box every few feet on the cable... Cons: -The pull wire it's very fibrous... Wish it was more like an actual string. -Wasn't free? All in all if you want 1Gbit or the potential for 10Gbit in the future at reduced length runs or plan on using PoE then this cable is pretty much perfect in my book. Don't buy the cheapest stuff it will bite you seeing as its usually CCA and requires more power to get signal down the line and doesn't even meet actual certification requirements to my knowledge. It seems like a very well built cable in a normal 1000' ft spool box. Wire colors are strong and seems of sturdy construction. I plan to buy more cable from this company in the future. 4.700Transmits data and video at great speed. Using this high-quality Cat6 23AWG wire I created a gigabit LAN that proved to experience no trouble delivering data and video at amazing speeds. Besides performance and price this product was also timely delivered. Recommended! I purchased the solid cable while building our house. It is easily some of the best cable that I have owned cat 5 or 6 especially at the price. I use this for a mix of network and HDMI over ethernet. Since I was running this in the walls I opted to go for Cat 6 as an attempt to future proof my needs. I have used this cable in punch down keystone jacks a punch down panel and using traditional RJ45 connectors. I went through the whole 1000' box without an issue. Do be careful when stripping back the outer jacket this is pretty thick cable and it could be easy to cut the inner twisted pairs. I did not have any issue but I could easily see this happening. My only complaint was that I ran out by miscalculation and was not able to get more shipped in time before drywall was to go up. I had to settle for some inferior cable at a big box store. Having set up two offices with this cable I can report that it is extremely easy to work with. Will buy again if I need it in future. I was very happy with the fact that this cable didn't kink up or prove difficult to pull from the box. It can make things really difficult if the cable is hard to pull. Luckily I didn't experience that with this cable. Great item that I would buy again. got that security system up at last. Full 10-gig throughput on dozens of cables I have made. 0 failures. I love cable. Always works as expected. First time using wire but it won't be the last. Quality of the wire is high. The roll I got had an extra 3 feet in it. The wire pairs are pure copper as noted strong and well-made. Termination was tight secure and reliable with 110 punch-down to patch panel and Keystone wall jacks. Considering the price point and quality I think I will be using again. High quality all around. I don't have he equipment to actually tell you the MHz but I have worked with lots of other wire and would hands down buy this again for the price! 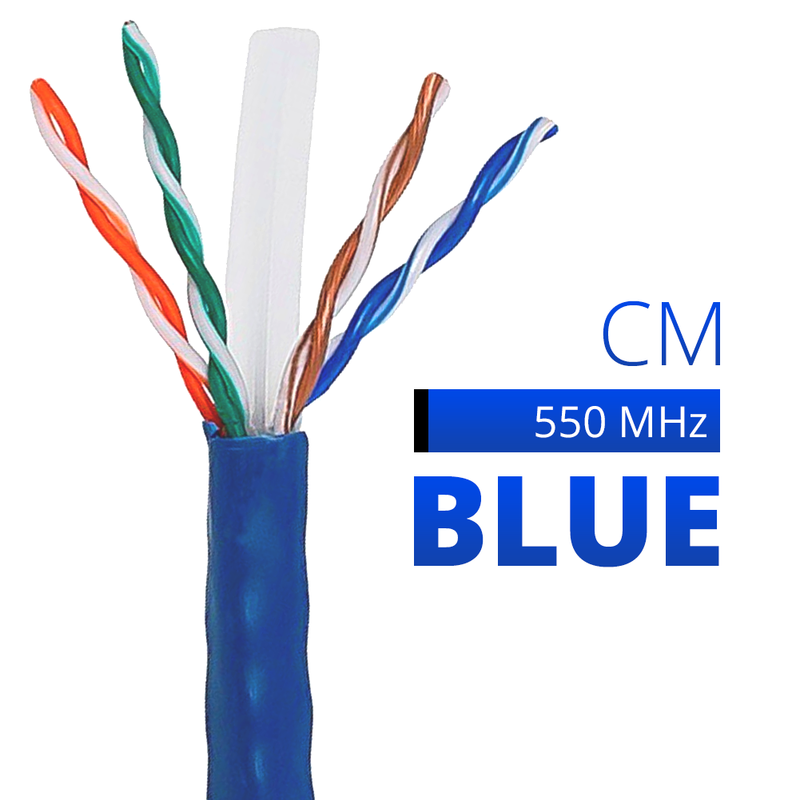 4.200Great value and high-quality Cat6 Cable. High quality cable - good stuff. The cost is less than may competing brands and standard CM Cat6 is sufficient for all the residential wiring I am doing. 4.500The best network cable I have ever worked with. I'm surprised that I am writing a review for a box of cable however this is worth it. I am really impressed with this cable. I know a fair amount of what I'm impressed with is part of the CAT6 spec but still this is great. Nice and thick outer insulation thicker than expected insulation on the twisted pairs but does not impair cable creation. Great plastic + divider down the middle. Excellent speeds. No problem getting gigabit. You can tell this is quality cable. Not CCA or whatever it is called you get a lot of copper in this box. Could not be happier with it. Very easy to work with CAT6 cable. Colors are very easy to see and untwisting is easy to slip connector ends on. Easy to pull and crimp. 5.00029 lb compare to 26 lb for 1000 feet compare to others. Never used any other wire but work fantastically. Good quality wire easy to use without much trouble. I am a basic home owner not a technical guy to specify the quality. I used this for 16 60-foot runs in my house. Every connection is working perfectly. This is the cable you want to buy if you are running Cat6 drops. It is flexible has a nice jacket and beats cable that costs double. I have not had any issues with snags or knots in the pull box. I will continue to buy this cable. Works just as advertised. Not much more to say when something meets expectations. Arrived quickly I have ordered from this vendor before and will do so again. Pricey but def worth it. Had some Cat5a I snagged up before 8 years ago from Home Depot. Pails in comparison to this brand. Home depot would only carry junk. This brand is so much nicer and easier to cut/crimp. It's nice when you have wire the moves where you want it to. i have already made several cables with it; my TRENDnet 8P/RJ-45 Crimper that i also bought worked very well. Note this cable is cat-6-higher rated than cat5 or 5e. Tho cat5e is supposed to work with Gigabit Ethernet 1000Mbps so you shouldnt need cat 6. but i wanted some extra margin over and above the spec. And this is SOLID copper wire. Oh and the cable pulls out and uncoils really nicely. No problems with that. 4.700Great Deal when wiring Rooms! I was adding some enclosed spaces to my Shop/Man-Cave and wanted to make sure I ran Network Cable for Media or whatever other reasons. Some said just use wireless and I will but like the idea of a hardwired connections being available as well. Plus I like to tinker with equipment and some older stuff only a cable connection is the option. Also given the walls and use of metal studs in some locations wireless signal strength might be an issue. One of those wish I had done that when the walls were open kind of choice. The cable is inexpensive too run and I have it all terminating in a room that will have patch panel switches router and what ever else. One other thing I ran two Cat6 lines to each drop. Against the cost of cable it was easy to plan for a dead/damaged cable later . Great Product solid wire aided in making the drops and pulled through the cavities and more durable.or other needs. The price point of Cat6 was only slightly over Cat5e so opted for it. Works great in wall and to keystones. The core of the cable not required by cat6 spec gets in the way when making patch cables and when punching down to a patch panel. We just bought a new home 3000 Sq Ft and the CM allowed me to pre-wire my house before dry wall. I basically wired the every room in the house including the master bathroom and the back/front patio. Everything was routed to the Tel Box in the master closet for server/switch setup and we still had left over wires about 200 ft. left. Average run was about 75 ft. Perfect for our house. Wired 5 Bedrooms 2 in the Living room game room kitchen garage master bathroom guest bath room back patio front patio and still had enough to make 5 plugin lines for computers. One big box of network cable. Yes indeed. I am using for ip cameras with POE. They are working great so far. Pulls out of the box okay so far but I've only used about 75-100 feet. The cable comes out of the box and wants to form a spiral so you will need fish-tape to guide or pull through wall cavities. Need a lot 'o' cable? This will do the trick! Our network is humming along just fine with this cable. I bought the stranded cable which appears to be high grade copper. The box unspools OK so far. The big problem was that the cable was difficult to fit into the standard RJ45 connector. The internal divider that eliminates crosstalk is a little on the thick side. Its very hard to get it to fit in the connector. I would not really recommend this stranded cable for crimping your own patch cords. The solid copper cable for punched down installations however would probably be great stuff. cable works great for risers without central air condition. also in drop pipes from ceiling as well as wall drops. NOTE: you need to have special rated cable wire for installing in riser ceilings with central air/heating systems due to fire code check your local regulations. Its cable it terminated easy it pulled clean. The only thing would be to get a pull spool for the same price but that doesn't exist so this is great. They sell and distribute quality cabling. This is my second roll from them. The cable feeds rather easily and I have not had issue with it snagging. 1000feet is more than most people will need in their home but it is perfect for all of my projects. The covering is easy enough to remove and install on a patch panel or jack. I highly recommend this cable. This is the first time I've installed ethernet but this cable seems reasonably priced high quality and shipped just fine. Unless it turns out that the last five hundred feet or so is full of breaks and bad insulation I think it's a great product. I typically buy my Network cables at another website that rhymes with Bono rice. I decided to try somewhere else because I needed the wire fast and didn't want to pay a fortune in shipping. shipped the cable inside another box which kept the cable box intact. I ended up using 964 ft of wire... how did I know that exact amount? The wire gives you feet markers eliminating the worry if that last run will be long enough. I have not had a chance to test the wire but I had zero snags from the box. Great cable at a great price. Liked this box of cable. Did its job very well. Was very easy to dispense the cable. Cable is of very good quality. Great product. I wired my entire house with CAT6. I bought two for a 2500sq ft house and still have plenty left over. seems to be of quality material. Had bought some before this and it seems to be of comparable value and quality. Hard reliable cable that seriously performs. I am a network guy and used this to setup my whole server build and maintain my 1000BaseT network. Definitely use 2 piece connectors or straight through cat6 ends on this cable! I must admit that I was a bit nervous about buying this wire. In the end however I was very pleased. I run wire for a living and have dealt with some horrible tangle free wire in the past. This wire was easy to pull and so far has tested well. Additionally I looked at wire at a Home Depot near my house whose wire looked cheap. This was solid thick wire with the divider between each pair which is exactly what I wanted. Cable worked out great. Never got caught or tangled and pulled out the box very easy. Ran it through my entire house and had no problems with it at all. Very nice wire and a great price. The box of 1000 feet of cable arrived ahead of schedule and in good condition well packaged. As a precaution I applied 2 pieces of shipping tape to the lid of the box to ward off any problems with the lid opening during wire pulling or transport. I pulled over 500 feet so far in my new construction home with only 1 kink. It is thick wire but the install was nearly flawless. I'd buy again. I bought 2x1000ft boxes of this cable to wire my new house. Ran 3 lines to every room. It is incredibly easy to work with and the quality is excellent. I would recommend this product to anyone with a large wiring project. This has the internal cross-web divider. Strips easy. Solid copper not the cheap aluminum clad copper. I did a pretty exhaustive search and I think this was the best deal for high quality CAT6. Still...probably twice as expensive as CAT5. Used this to wire up the house. I measured out exactly 1000ft so it is the length that they said. For some reason I was worried that they might skimp me there probably because it was such a great price. I really loved the way that this wire is constructed. The inside of the wire looked clean and proper with a string to splice it and a plastic divider to keep it protected. The best part about this is the price is half of the local hardware stores. Functions as designed. I bought this to run Ethernet in my house. All runs have tested out at gigabit speeds longest run so far is about 80 ft. Cable pulls easy without twists or kinks. Exactly what I was looking for. I hired an electrician to run Ethernet throughout the walls of my house. To save costs it was recommended that I provide my own cat6. I ended up doing dual runs to each drop using this cable and one box from the electrician. No problems at all running the cable. The spool never got stuck or caught on a knot. Really smooth installation. Right now I'm wiring the cat6 to a patch panel and I'm having no problems. I test each connection with a network tester and everything looks great. Minor complaints are that the box comes lose at the grab handle. I had to tape it down to use the handle to move the box around. Not a big deal. I'd probably buy this again if I need to run more cable in my house. Ran around 500 ft of this cable over the weekend no issues and appears to be a high quality cable. Most of my runs were 75 ft+ so having an in wall rated cable with solid conductors was important. Not sure I'll even need the capability of the Cat6 spec but why not future proof a big install - the time it takes to rerun 1000 ft of cable far exceeds the price difference from cat5e to cat6. Pulled though some tough spots and the jacket did not get any nicks or damage. Cable did tend to kink up when pulling though joists but I don't think any other cat6 cable would be better. Spool box was great cable came out flawlessly with no issues. Delivery was flawless as usual. Overall a good purchase.